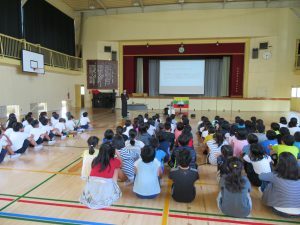 ASEAN-Japan Centre conducted a school-visit to Nanakuniyama Elementary School. 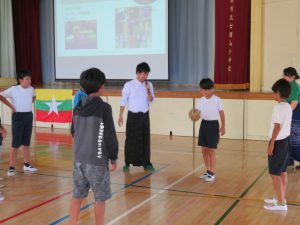 In the school-visit program, a Myanmar national living in Japan gave a presentation on the basic information, culture, language, and others of Myanmar to the 5th grade students. The lecturer encouraged teachers and students to get involved in the activities to make the class interactive, and introduced a fortune-telling of Myanmar, Myanmar traditional sport called Chinlon, Myanmar traditional costume, and Myanmar sunblock called Tanaka.